What’s are your New Millenium Resolutions? I know what one of mine is — to be in better shape so I can perform at my best in all areas of life. I am going to take the time to exercise, set goals, and stay committed to reaching those goals. The next century is going to be an exciting one, and I am going to work at making it a successful and rewarding one, both on and off the golf course! In the December issue of Golf Illustrated, I demonstrate some easy and effective conditioning exercises to perform on the golf course. These exercises lead to improved physical and mental control. As a golfer, I’m sure you are well aware of the importance of CONTROLLING the clubhead throughout the golf swing. 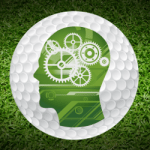 The physical functioning of involved muscles that control the head of your club can only be addressed through consistent repetition of not only your swing, but, the physiological component of conditioning your golf-specific muscles. 1) Seated Hamstring Stretch — This stretch can be performed while sitting on a bench, or in the golf cart (after your golfing buddy has gotten up to hit his/her shot). In a seated position, extend one leg out from your hip and keep it straight. Remember to keep your back as straight as possible and gradually lean forward from the hips (don’t round your back by leaning forward from your chest area). Feel a slow, deep stretch and hold this position for 15-20 seconds, breathing deeply and slowly. Release slowly and repeat with the other leg. Do this stretch a few times during the round (5-10 times) and you’ll notice that your back will be less likely to stiffen up through the round. 2) Chest Stretch — This one can be done by raising your arms at right angles to your shoulders and leaning into a doorway (before and after the round), or onto the side of a golf cart (during the round). After raising your arms to right angles with your shoulders (elbows should be parallel to the shoulder level with the forearms pointed straight upward), lean forward slightly until a stretch is felt in the chest area. Lean as far as you comfortably can and hold for 15-20 seconds (don’t bounce in this position). Release gradually and repeat 2-3 times. Do this stretch before, during, and after the round for maximal benefit, as the chest is highly involved in the typical golf swing. The chest generates power to a large degree throughout the downswing and as you are making contact with the ball. Try these stretches for yourself. Don’t take the lazy route and neglect them. They only take seconds to perform so remember, It’s the only way you will ever know what a difference they can make in your golf game!